Sarama Resources Ltd. is pleased to advise that it has agreed to acquire a 100% interest in the Botoro exploration property in south-west Burkina Faso. Botoro complements Sarama's mineral property interests in the highly prospective southern Houndé Belt and increases the size of its 100%-owned ThreeBee Project to approximately 660km². "We are excited about the acquisition and the exploration potential of the Botoro Property and also the strengthening of our position in the southern Houndé Belt. Importantly, Botoro complements our 100% owned ThreeBee Project and provides us with additional options outside our current joint ventures in the Houndé Belt. 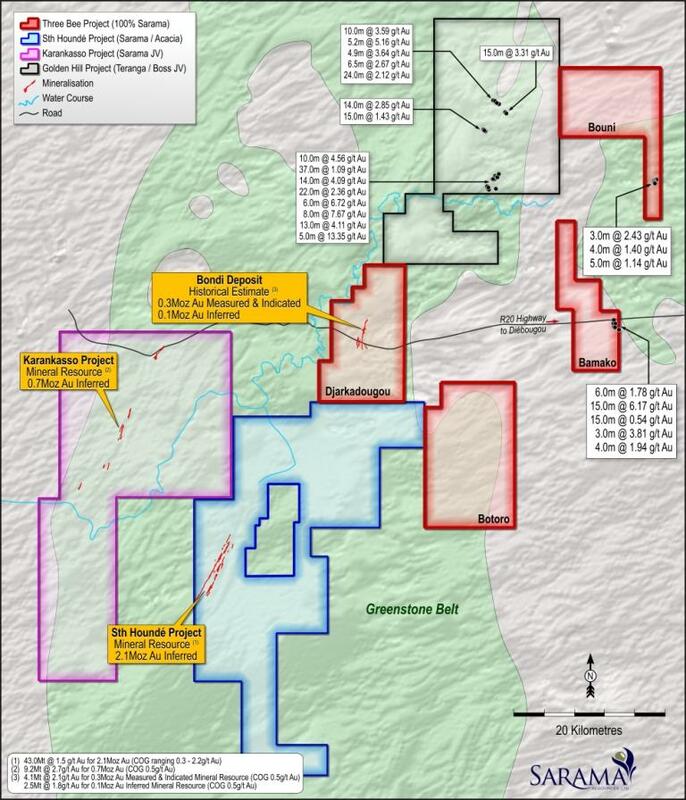 Teranga's recently announced discoveries at their Golden Hill Project, situated less than 20km from Sarama's Bondi Deposit, further shows the potential on the eastern part of the belt and we look forward to the results from our generative exploration work on Botoro that has already commenced." 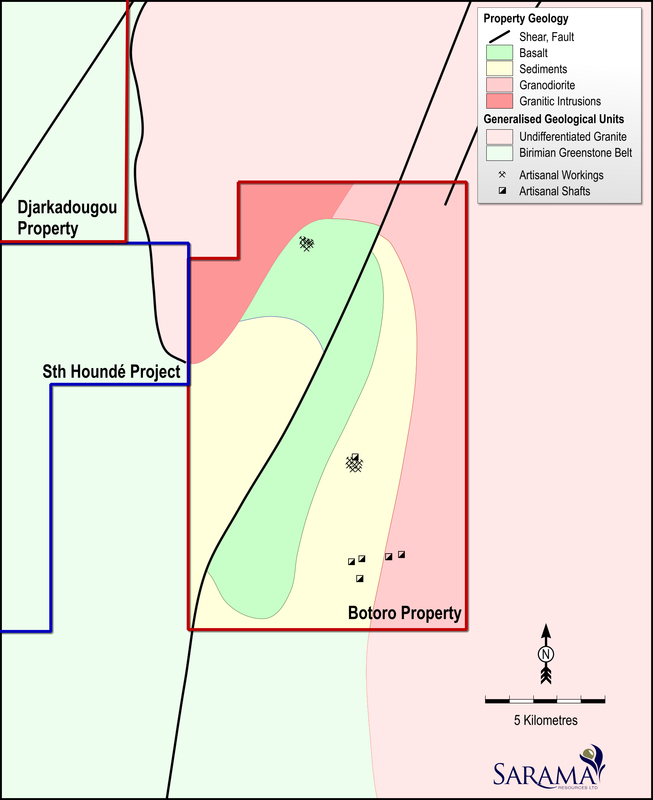 The 224km² Botoro Property is located on the eastern margin of the Houndé Belt and is well positioned relative to Sarama's existing mineral property interests in the area. Apart from having untested exploration potential itself, the Property is a key component of the Company's 100%-owned ThreeBee Project, which also includes the prospective Djarkadougou, Bamako and Bouni Properties. Botoro is located approximately 20km from the centroid of the Bondi Deposit (on the Djarakdougou Property) which has a historical estimate of mineral resources of 0.3Moz Au measured and indicated and 0.1Moz Au inferred and offers potential for the discovery of truckable feed to support eventual project development. 5m @ 1.14g/t Au from 33m (FRC101, Bouni). These intersections were returned in 2011/12, but have never been fully followed-up by Sarama given the Company's coincident discovery on the South Houndé Project which subsequently became the primary focus. When considered in the context of the demonstrated prospectivity of Sarama's other properties within the ThreeBee Project, these historical intersections demonstrate good potential for the discovery of exploitable gold mineralisation. It is notable that the Botoro Property is underlain by the same geological sequence of rocks as Teranga's emerging Golden Hill Project to the north. Recent exploration by Teranga on the project has returned several higher grade intersections over mineable widths which reinforce the excellent historical drill results of previous operators on the Golden Hill Project. The geology of the Botoro Property is typical of other properties in the Houndé Belt where Sarama has had significant exploration success and broadly consists of a sequence of alternating volcanic and metasedimentary rocks oriented in an approximate north-south orientation (refer Figure 2). In addition to the presence of a regionally extensive granitic belt along the eastern and northern margins of the Property, several localised felsic intrusions are also present, all of which result in zones of deformation and contact metamorphism. A property-scale fold structure is interpreted, which is bounded on its eastern side by a district-scale north-north-east trending shear zone. The diversity of these geological units and their litho-structural contacts present areas of interest for gold exploration. The Property is also interpreted to feature several regionally extensive first and second-order faults and shear zones, further adding to the Property's exploration potential. 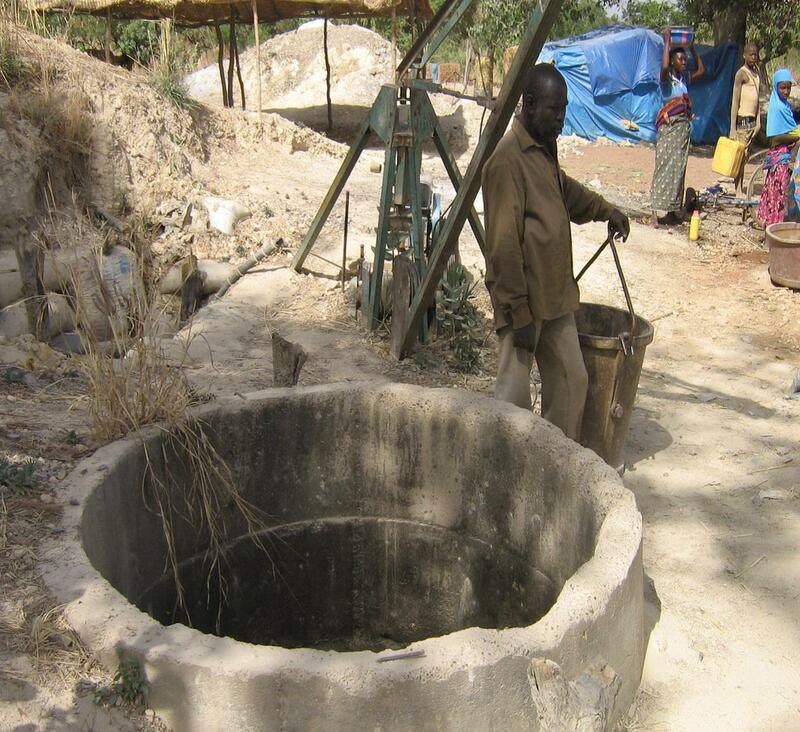 Site visits conducted by Sarama have identified several areas of significant gold exploitation by artisanal miners. In general, these activities targeted gold-bearing quartz veins down to depths of approximately 40m (refer Plates 1 and 2). Gold was also noted in the weathered zones of both mafic and felsic rock units. 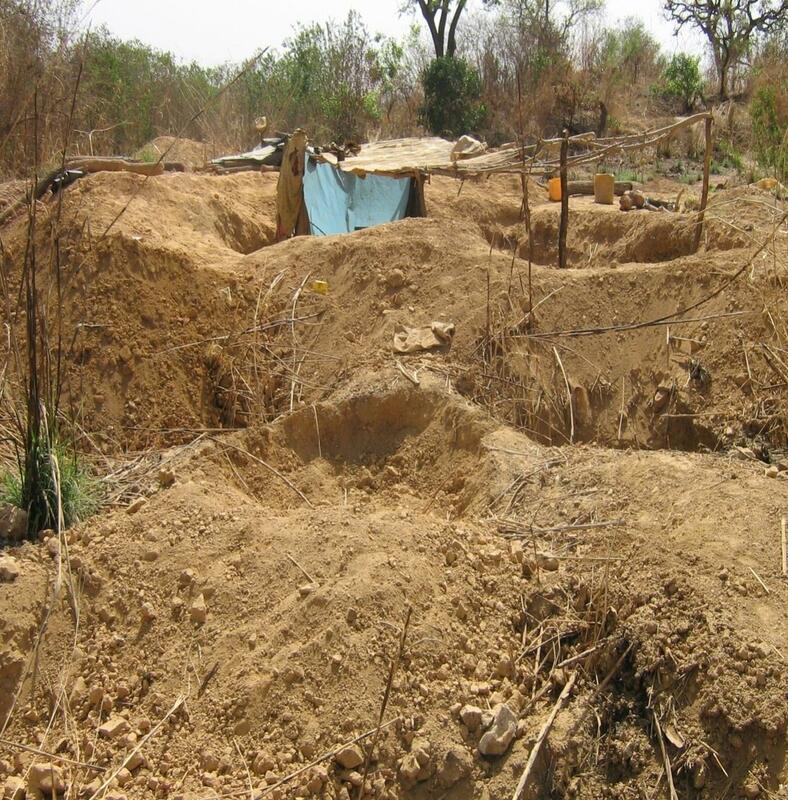 Sarama plans to focus initial exploration activities on artisanal mining areas and prospective zones located proximal to major structural features within the Property. Forward work programs include geological mapping, regolith mapping, soil geochemistry surveys and data collection from artisanal workings.